When setting up your shop it is crucial to carefully consider the structure before you start building. Just like when constructing a house it is always best practice to get the fundamental architecture in place first. Our best advice is to fetch a piece of paper and sketch out how you want to organize you shop. However you choose to organize your navigation it will have impact on the rest of your shop - e.g. how you organize your product catalogue and tag your products. The image above is an example of a shop where the top navigation has been structured by the main categories Women - Men - Kids - Brands. Under each main category the individual types of sport has are listed (Running, Basketball etc.) On the third level of the navigation structure are the products organized by relevant type of equipment for each sport (e.g. 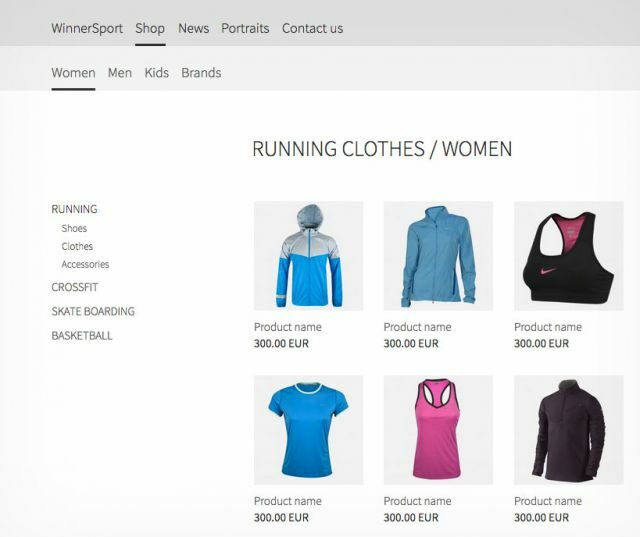 under 'Running' you´ll find the following product categories: Shoes, Clothing, Accesories). Pictured above is the 'Brand' main category broken down by sport and by product group. The first level of the navigation menu contains all the brands in the shop (Puma, Adidas, Nike og Reebok). In the underlying levels you will find the different sports with relevant product categories underneath each sport. In this case, the differentiation between Men, Women and Kids has been obmitted. All products are included on the pages directly from the central product database using tags (which functions like a filter). This way you are sure that only the products with matching tags are displayed in the different categories. Read below how to tag you products. Once you have defined the fundamental structure for your shop, the next step is to get your products displayed on the product pages. This is done by tagging the products with matching keywords that correspond to the products. Let´s assume that you have a sports shop and that you are about to add shoes to the shop. Tag the shoe product with the categories mentioned earlier (e.g. Shoes + adidas + women + running + offer). 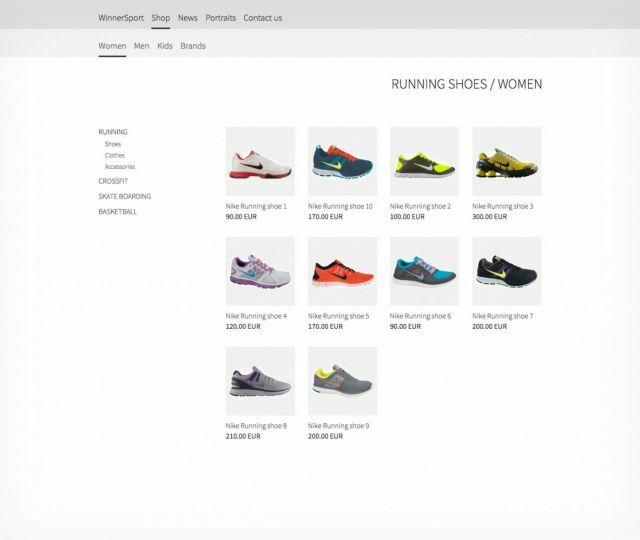 In the picture above your can see an example of a shop page displaying all running shoes for women. The products are retrieved by adding the 'shop catalogue' module to the page and then instructing the module to show all products tagged with the keywords: 'Running', 'Shoe' and 'Women'.